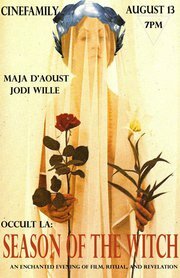 Saturday, August 13 at 7 â€“ 9 pm at the normally benighted town known as Los Angeles, Maja D’Aoust, my lovely co-author of â”The Secret Source” (coming soon in a new hardcover edition), and beloved ex-mate Jodi Wille, will be presenting at Cinefamily (formerly the Silent Movie Theatre) at 611 N. Fairfax Ave., an evening of film and discussion titled SEASON OF THE WITCH. Yes, I know, summer in Los Angeles is not a particularly witch-friendly season, but I’m sure Maja and Jodi’s presentation will recast summer’s spell in addition to striking down the malevolent patriarchal curse of the ages. If I weren’t getting this monster book called Ritual America together for the printer, I’d be there, particularly for a screening of Curtis Harrington’s Wormwood Star starring Jack Parsons’ elemental witch mate, Cameron. Brian â”Black Magick” Butler (in contrast to the evening’s White Witch theme) is bringing in and discussing this filmand a new print, I’m told.